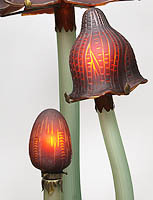 A Large French 20th Century Whimsical Art-Nouveau Style Mushroom Molded Glass Lamp, After Emile Gallé's "Les Coprins". The three twisted and curved molded green glass mushroom stems surmounted with ruby-red glass shades, all raised from a brass base. Circa: 1960-1970. This beautiful reproduction of Gallé's famous mushroom lamp, of which only three original models exits, were limited reproduced last century in France. The original was commissiones as part of the décor of a dining-room designed as a forest. One of the 1904 original lamps is currently at the Musée de L'Ecole de Nancy, in Nancy, France. Another one is currently at The Kitazawa Museum of Art, Nagano, Japan. Literarture: Art-Nouveau and Art-Deco Lighting by Alastair Duncan, Simon and Schuster, New York 1978 - Page 32-33. Émile Gallé (8 May 1846 in Nancy- 23 September 1904 in Nancy) was a French artist who worked in glass, and is considered to be one of the major forces in the French Art Nouveau movement. Gallé was the son of a faience and furniture manufacturer and studied philosophy, botany, and drawing in his youth. He later learned glassmaking at Meisenthal and came to work at his father's factory in Nancy following the Franco-Prussian War. His early work was executed using clear glass decorated with enamel, but he soon turned to an original style featuring heavy, opaque glass carved or etched with plant motifs, often in two or more colours as cameo glass. His friend and patron Robert de Montesquiou sent him to Bayreuth with a recommendation to Cosima Wagner, which led to a great enthusiasm for Parsifal. In 1875, he married Henriette Grimm (1848-1914). In 1877, he then assumed his father’s role as director of the Maison Gallé-Reinemer. In that same year, he was elected Secretary-General for the Société centrale d’horticulture de Nancy. His career took off after his work received praise at the Paris Exhibition of 1878. Within a decade of another successful showing at the Paris Exhibition of 1889, Gallé had reached international fame and his style, with its emphasis on naturalism and floral motifs, was at the forefront of the emerging Art Nouveau movement. He continued to incorporate experimental techniques into his work, such as metallic foils and air bubbles, and also revitalized the glass industry by establishing a workshop to mass-produce his, and other artists', designs. The factory would employ 300 workers and artisans at its height, including the notable glassmaker Eugène Rosseau, and remained in operation until 1936. Gallé wrote a book on art entitled Écrits pour l'art 1884-89 ("Writings on Art 1884-89"), which was published posthumously in 1908. What is less well-known is Gallé's social engagement. He was a convinced humanist, and was involved in organizing evening schools for the working class (l’Université populaire de Nancy). He was treasurer of the Nancy branch of the Human Rights League of France and in 1898, at great risk for his business, one of the first to become actively involved in the defence of Alfred Dreyfus. He also publicly defended the Romanian Jews and spoke up in defence of the Irish Catholics against Britain, supporting William O’Brien, one of the leaders of the Irish revolt. In 1901, together with Victor Prouvé, Louis Majorelle, Antonin Daum and Eugène Vallin, he founded an Art Nouveau movement known as École de Nancy (The Nancy School). Many of Gallé works are kept at the Musée de l'École de Nancy. 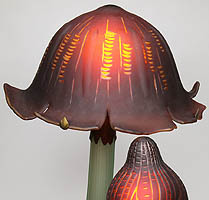 A Large French 20th Century Whimsical Art-Nouveau Style Mushroom Molded Glass Lamp, After Emile Gallé's "Les Coprins". 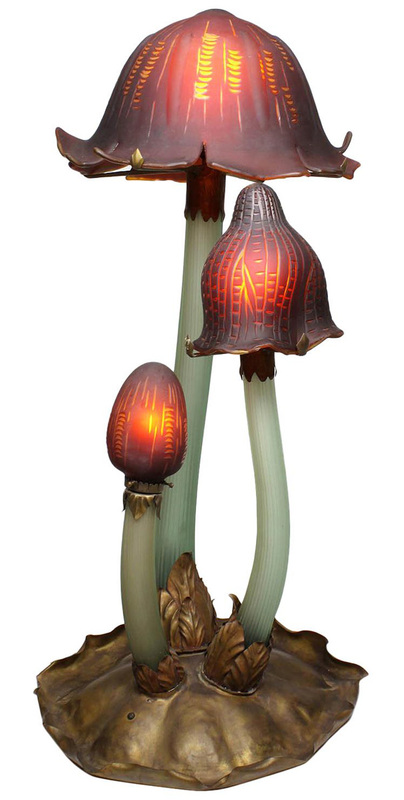 The three twisted and curved molded green glass mushroom stems surmounted with ruby-red glass shades, all raised from a brass base. Circa: 1960-1970. This beautiful reproduction of Gallé's famous mushroom lamp, of which only three original models exits, were limited reproduced last century in France. The original was commissiones as part of the décor of a dining-room designed as a forest. 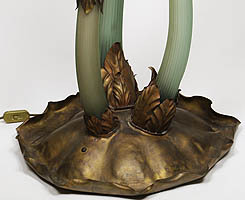 One of the 1904 original lamps is currently at the Musée de L'Ecole de Nancy, in Nancy, France. Another one is currently at The Kitazawa Museum of Art, Nagano, Japan. Art-Nouveau and Art-Deco Lighting by Alastair Duncan, Simon and Schuster, New York 1978 - Page 32-33. Émile Gallé (8 May 1846 in Nancy- 23 September 1904 in Nancy) was a French artist who worked in glass, and is considered to be one of the major forces in the French Art Nouveau movement.